One of Unblind’s best clients has been Doug Hudson, of The Hub, formerly Song of Solomon Resources. He has been producing DVD series for more than 10 years. His first was with Tommy Nelson, the pastor of Denton Bible Church. 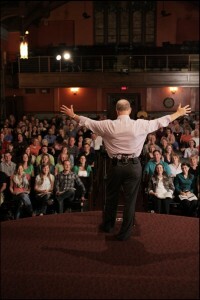 The Hub’s goal is to produce a DVD series for every book of the Bible. Since partnering with Doug, we have produced Tommy Nelson teaching the book of Romans, and Matt Chandler (The Village Church) teaching the book Philippians. And we edited a weekend conference with Mark Driscoll, of Mars Hill Church in Seattle, teaching from the book of Song of Solomon. 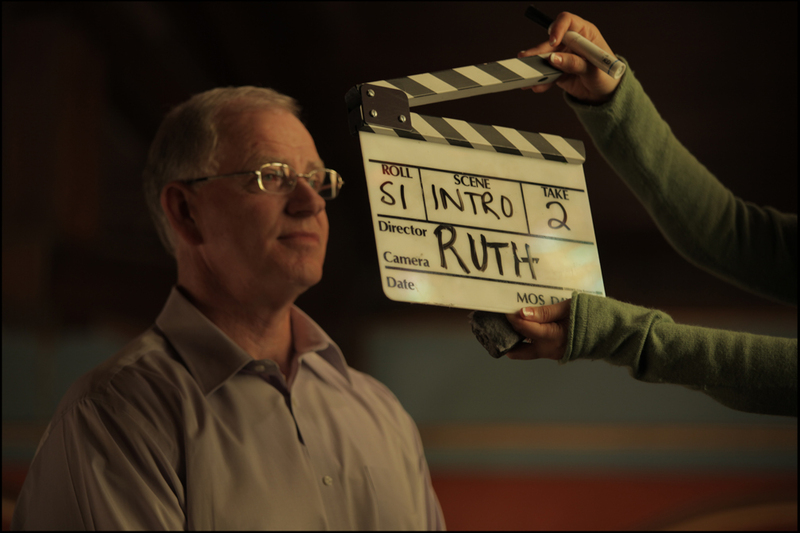 Our latest project was once again Tommy Nelson, this time teaching from the book of Ruth. Upon discussing this project with Doug, we knew we wanted to shoot with DSLR’s if we could. 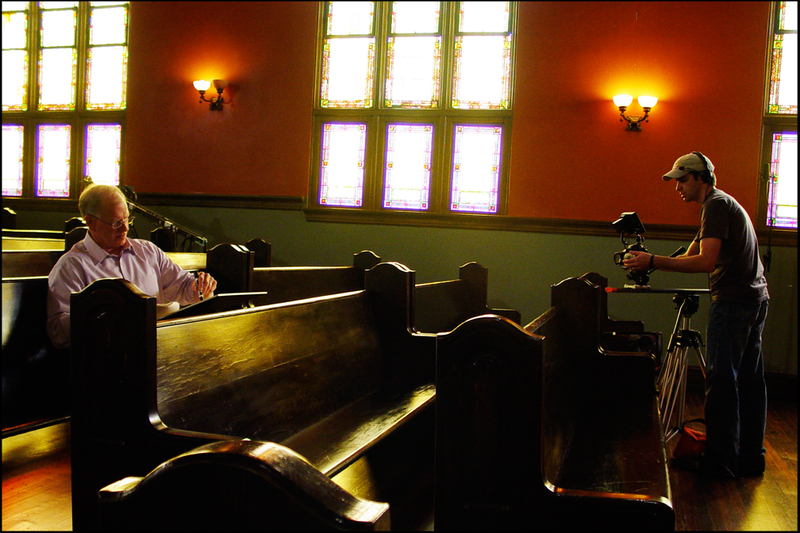 But we knew that we could not shoot entirely with them, so we decided to go with the EX1 as our main camera of choice. Our “money” shot, which was our medium to close up, was an EX1 positioned a foot or two off center. 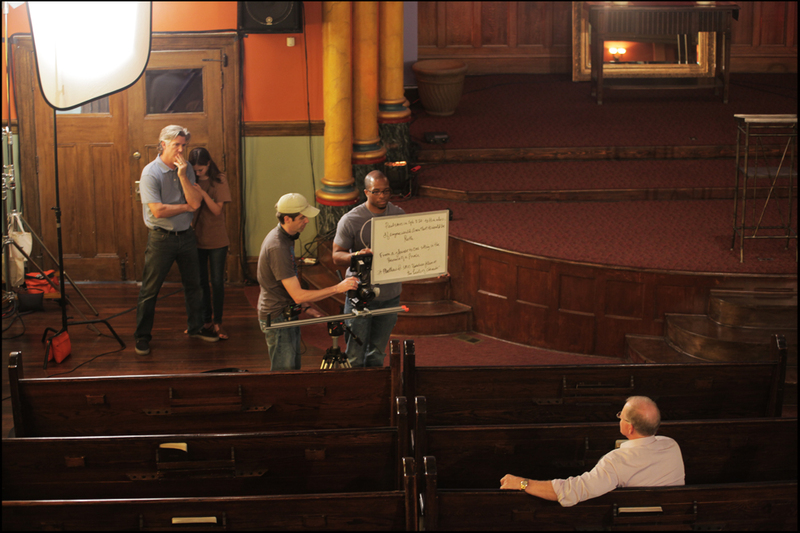 And right next to it, we had a 5D Mark II….dead center, shooting a wide. This was basically our scapegoat camera for the edit. We had one operator manning both of these center cameras. On the right we had an EX1 on a 10 foot jib getting our sizzle shots. And our last EX1 was on a steady cam, operated by Travis Petty of Frozen Fire Films. And lastly we had a 7D on the left, getting medium shots. We knew going into this, that shooting with EX1’s and DSLR’s there would be the gamble of them not matching, so our strategy of using the DSLR’s was to put them in positions so that they were not critical to the final edit. But thus far, the 5D at the center wide position looks great. The 7D looks good to, but the depth of field difference is noticeable when compared to the EX1’s. For these types of DVD series, the are always intros and outtros for each teaching section. To shoot these, we shot with the obvious….a DSLR. We used a homemade slider (parts from Igus) to get slow moving dolly moves. We recorded with a double audio system for the entire project. Stay tuned for a short behind the scenes clip, and some footage from the project with the EX1 and DSLR’s. Doug Hudson talking through Intros with Tommy Nelson. 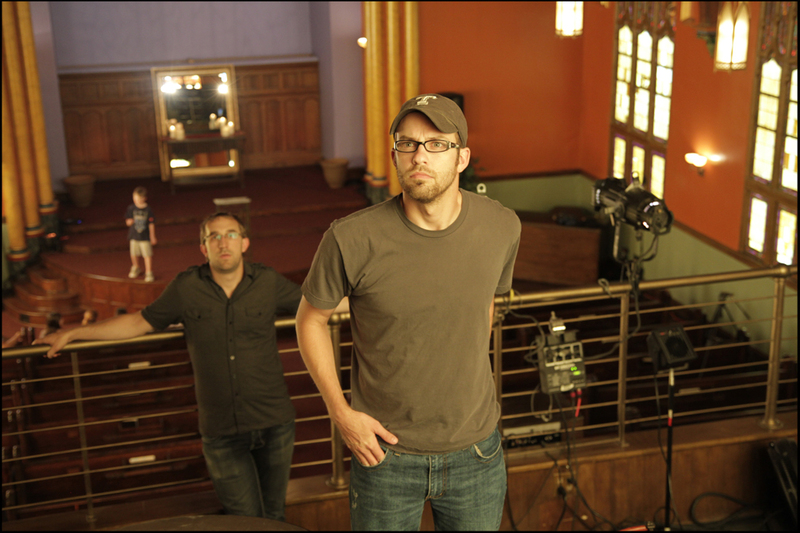 Drew Rodgers standing in, while lighting is being adjusted. Shooting an intro to a session. 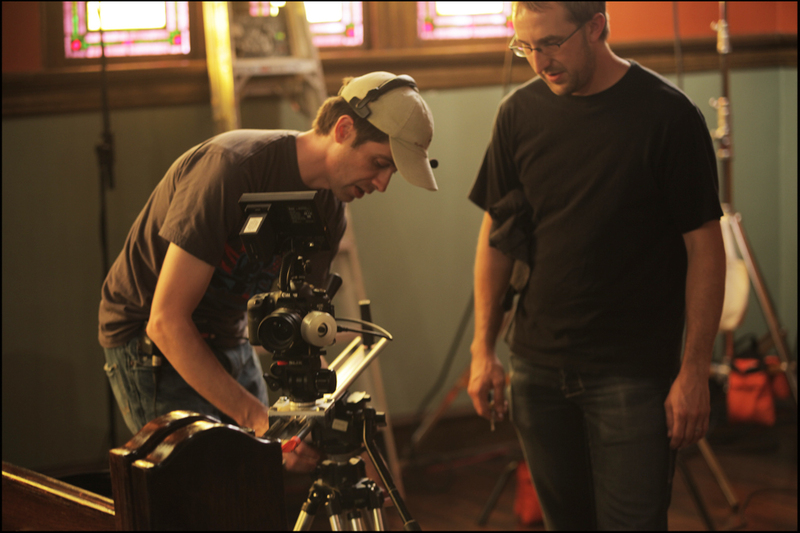 Matt Coleman & Travis Petty setting up a shot. The pics look great. Can’t wait for the series to come out. I see you’ve got a white board beside the camera with what I’m assuming is his outline. Have you taken a look at ProPrompter’s teleprompter software for the iPod, iPhone and iPad? I bought it for my iPod and am totally loving it. Very customizable. You can set the scroll speed or control the scrolling with another iPod. I personally found it very liberating to spend time scripting an efficient, effective message and film it using the teleprompter, as compared to me rambling on and on… missing points, being repetitive (which is totally my tendency). Here is the first video I shot using this software on my iPod. Bodelin also sells some expensive (I feel) hardware solutions so you can mount the iPod directly in front of the lens. I am currently building my own version with a piece of glass scavenged from an old teleprompter from a local TV station. Also… I too built an igus slider… and am loving it. One of the best investments I’ve ever done. Thanks for your blog info. Hey Mark, that whiteboard was his outline. Tommy decided to bring it for his intros/outtros. They were written on the spot, so he needed a quick way to write and erase this thoughts. I have seen the Proprompter, looks very cool. It is amazing to be living in the production world during these times. So much is advancing so fast. Great video by the way. 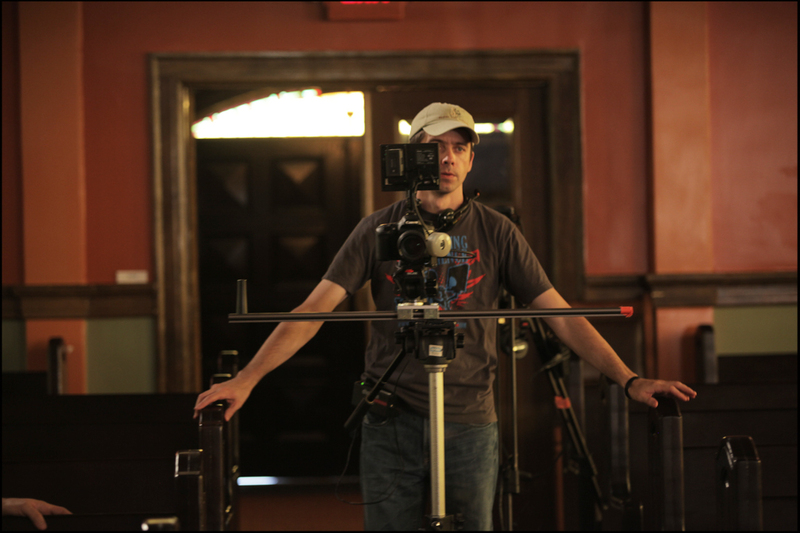 I love my igus slider too, though not so happy with it being made of aluminum. On my last flight it got banged up during the baggage check. I had it in one of Think Tank’s Big Humongous Bazooka cases, but when they took it out it got banged up. Talk to you soon. Tommy Nelson and Matt Chandler are both great! Love how technology is enabling the gospel to be shared in new ways. SLRs are doing amazing work now for video, it’s nearly exclusively what I use. Keep up the good work. Thanks Jonny. Its always a great time working with those guys!